The Mapping Network performed a hydrographic and dredge survey for a power plant’s coal ash ponds. These can be difficult because of the composition of material. With the combination our sonar, GPS, and years of experience with coal ash, we were able to give them an accurate estimate of ash volume. This entry was posted in dredge cost, Drone, Lake Map, Land Mapping, Sediment on February 8, 2018 by Moderator. The Mapping Network performed a dredging excavation analysis for a lake association on multiple coves with sediment issues. The Mapping Network first conducted a pre-dredge survey along with sediment probes of the coves. With this data, they were able to create models estimating the volume of material needed to excavate to a specific water depth. The Mapping Network has extensive experience performing hydrographic surveys on intake channels for power plants and drinking water intakes. On the example below The Mapping Network conducted a pre and post dredge survey along with calculating the amount of material removed. 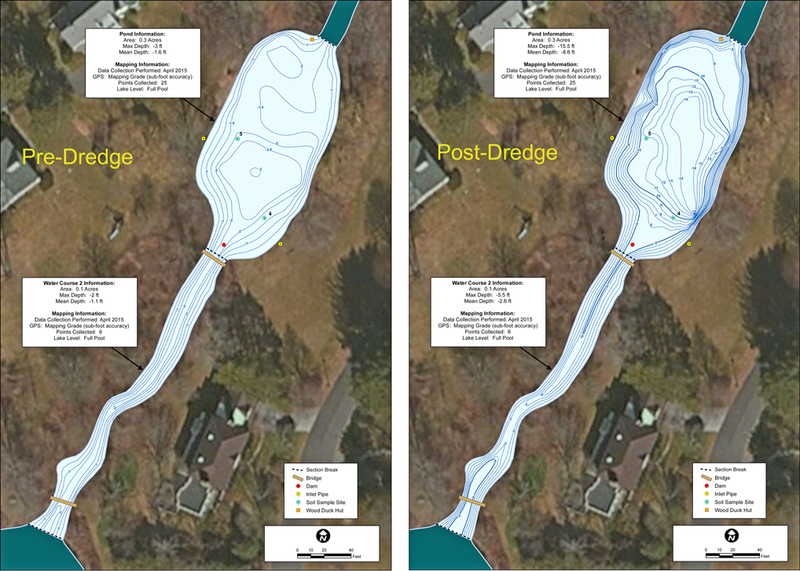 The map below is the post-dredge survey after all dredging operations were performed. Check out The Mapping Network on Twitter or Facebook for more examples and success stories. This entry was posted in dredge cost, Lake Map on March 28, 2017 by Moderator. The Mapping Network recently completed a lake mapping project for historic Winged Foot Country Club in Mamaroneck, New York. The client requested the creation of a detailed lake map for understanding true depths and water volume for seasonal irrigation planning. Additionally, The Mapping Network team collected sediment samples throughout the pond so the club can closely monitor sedimentation rates in the future. This entry was posted in Lake Map on March 28, 2017 by Moderator.